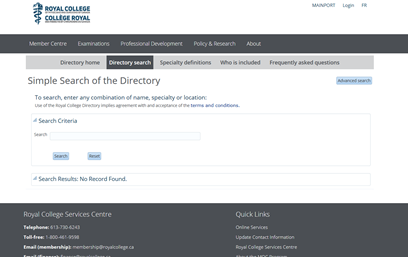 The Royal College of Physicians and Surgeons Directory is a searchable public resource where you’ll find specialists who are Fellows of the Royal College. You’ll also find other health care professionals and specialists-in-training who participate in the Maintenance of Certification (MOC) Program, the Royal College’s continuing professional development program. Please use Explorer, Google Chrome, Firefox, Apple Safari (both iPhone and iPad) as your browsers (MS Edge does not work well). You will need to get a referral from your family physician to make an appointment with a specialist.